How to install Mireo DON'T PANIC on a dual-SIM smartphone? A dual-SIM smartphone has 2 SIM card slots – a main one and an additional one. To ensure corerct installation and future performance of Mireo DON'T PANIC please make sure that, when the app is being installed, there is either a SIM card in the main slot (the additional slot may be empty or occupied), or there are no cards in either slot. Please do not try to install the app when only the additional slot is occupied. After updating Mireo DON’T PANIC for Android I encountered some problems with the keyboard. Update Mireo DON'T PANIC app to the freshest version through Play Store (Android Market). If this does not solve the problem, you can switch from Android original keyboard to Mireo DON'T PANIC built-in keyboard. To do this, go to the Settings menu, choose Keyboards and deselect Android option. Entering address for search seems inconvenient. You have to type the street name up to the end in order to enter a house number, even if the software has already found the street. In fact, this is not the case. You may not be familiar with the software yet. Let us study an example. E.g. 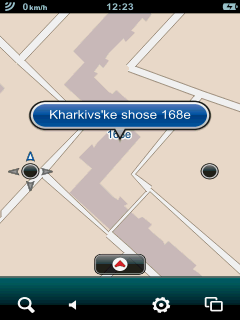 you need to find a house 168e at Kharkivs’ke shose, Kyiv. In most navigation systems you have to find a country, then a city, then a street, then enter a house number, and only after that you receive the result. In Mireo DON’T PANIC application you only need to type “khar s 168e” into the left search field (for your convenience, the left search field is the main one), and you instantly get the result. You don’t even need to enter the city name, apply the search category filter (All-Streets-POIs-Lon/Lat) or press the Search button! Is it possible to view and estimate the calculated route before starting the trip? 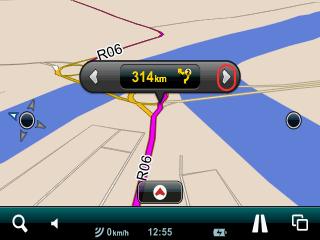 You can view the whole calculated route by tapping the screen just thrice: Menu (the button in the right lower corner of the screen), Route and the Map Locator button (the black round button with an arrow) to the right of the route ‘body’ (where the route distance and estimated travel time are displayed). 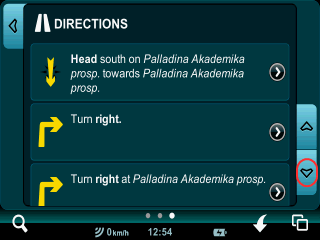 In addition, you can view text directions for the route, from one maneuver to another, by switching to the right page (Directions) from the central Route page. 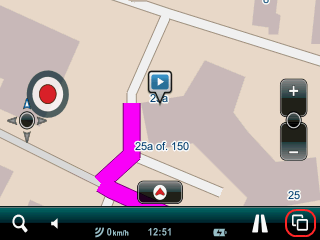 By pressing the Map Locator button for any maneuver you can view it on the map. 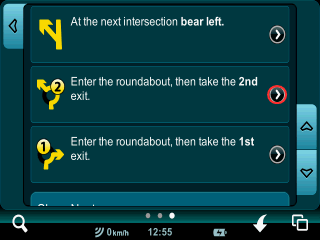 Then, by pressing the right arrow button on the control panel on the map page, you can view the following maneuver. Is it possible to simulate driving along the route? Yes! There is a Start Shop Demo button on the central Route (Trip) page. By pressing this button you can start route simulation. 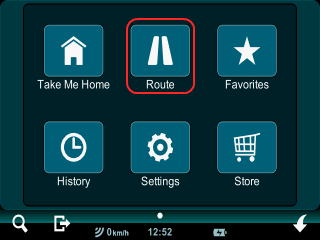 If you cannot find this button on your device, please try saving your route as Favorite and activating it from the Favorites (the right page); then the button will be available. I have found an interesting Send Location function in the application. How does it work? The application will ask you to choose a recipient and will send them a text containing the coordinates as a text message, and then will offer you to type a text by yourself and send it as another message for the same recipient. 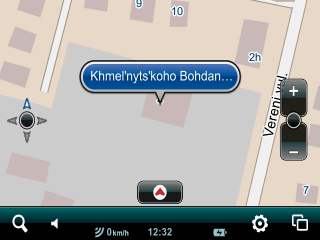 This function may be useful when you are travelling with a group and are willing to inform your friends about your location or some other important place. Another Android smartphone with active Mireo DON’T PANIC application displays a message that the coordinates of a location have been sent from a specific phone number. The application will offer to show the location on the map; the location will also be added to the Favorites –> left page –> Shared Locations. You can view the location in detail on the map, and/or use all functions available for locations, including adding it to the route. Text messages from the app can be received on a usual mobile phone (without Mireo DON’T PANIC installed), but in the case only the coordinates will be readable in the first message. What menu, map and voice guidance languages are available? 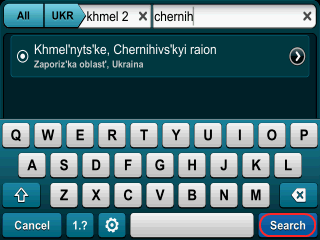 Please note that the map of Ukraine will be displayed in the Ukrainian (Cyrillic) alphabet if you choose Ukrainian UI language, and in the Latin alphabet (transliterated from Ukrainian) if you choose any other UI language. Voice guidance language (male or female voice) can be chosen separately from the UI language. In DON’T PANIC Android for smartphones and tablets the voice packages are downloaded separately from the Store – Voices menu page. What about the maps of other countries and regions? Users of Mireo DON’T PANIC Android version can check the full list of available maps on the Maps page in the in-app Store. This information is also available at the software developer’s website. Does Mireo DON’T PANIC navigation require mobile Internet connection? No! 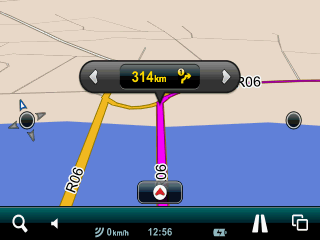 Mobile Internet (GPRS, EDGE, 3G (UMTS)) is not needed for GPS navigation. However, you will need it if you want to update or recover the application content, if no other Internet connection (Wi-Fi, PC via USB) is available. How much internal memory space does the application take when installed on a device? 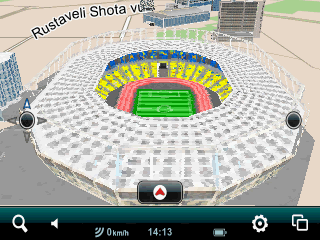 It is advisable to install the application onto a memory card, as the map files take quite a lot of memory space. For example, the map of Ukraine version 2011.09 takes 123 MB, voice guidance package for each language takes about 5 MB, and the other software files take up to 7 MB. Which Android version is needed to provide Mireo DON’T PANIC operation on a smartphone? The smartphone should have Android 2.0 or higher. I have a pocket PC with Windows Mobile 6.0 operation system and a Bluetooth GPS receiver. Will I be able to use Mireo DON’T PANIC? Yes. Mireo DON'T PANIC for Windows.CE is compatible with pocket PCs with Windows Mobile 6.0. 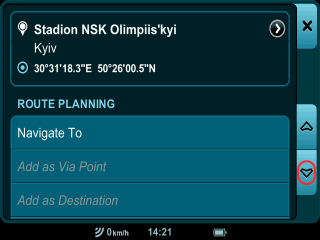 Bluetooth GPS is also supported. I have purchased commercial maps for an Android smartphone, but the application can not install them because there is not enough free memory space. What should I do? If you could not download commercial maps for any reason, or the map file was accidentally deleted, you can recover the purchased maps by using the content recovery function (Settings – right page – Recover Content), provided that you have DON’T PANIC Android version. In the case described above, clear some space on the installed memory card, or use a larger memory card, and recover content. 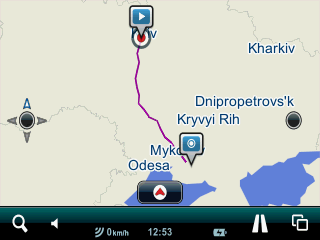 On the same page you can check whether newer maps are available by pressing the Check for updates button. Is the map in Mireo DON’T PANIC and iGO applications equally detailed? The map is equally detailed, the same map material is used; but please keep in mind that each application interprets the data in its own way and the route calculation algorithms are somewhat different, that is why the calculated routes will not necessarily be identical. 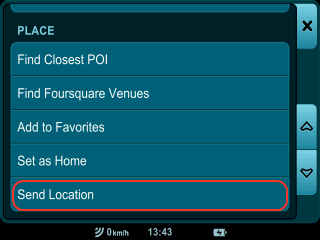 In addition, house numbers are displayed on the map in Mireo DON’T PANIC, while iGO8 does not support this feature. What is the functional difference between the 7-day trial map version and the commercial one? There is no functional difference between these versions. However, the commercial map version is not time-limited; in addition, it can be updated free of charge.